Apple confirmed the devices on Twitter with a post about the water-resistant nature of the iPhone 7 and iPhone 7 Plus. The new phones will come with Lightning-connecting earbuds and an adapter for 3.5mm headphones. Although these are not set on behalf of Apple's final design, but iPhone 7 will definitely bring users more bright spots. Therefore, we are not hard to guess that at the scheduled time there will be lots of users to replace their old iPhone with the new iPhone 7. When upgrading from an old phone to a new one, the first question you may ask is, "How do I transfer all my data and information from an old iPhone/Android to another?" 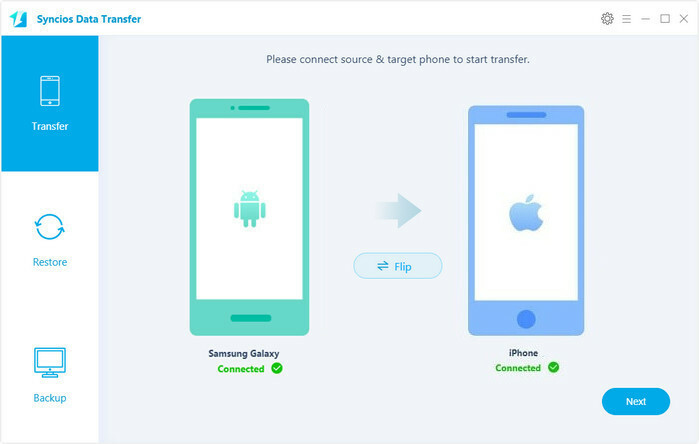 To help you complete this iPhone Transfer task, here are some tips for transferring your contacts, photos, music, documents, and more from your Android device to your new iPhone 7, iPhone 7 Plus. Apple offers the Move to iOS app to transfer your Android content to your new iOS device. If your old device is on Android version 4.0 or later, you can move your content to iPhone 7 with this method. On your Android device, turn on Wi-Fi connection. Plug your new iOS device and your Android device in to power. While setting up your iPhone 7, look for the Apps & Data screen. Then tap Move Data from Android. *Note: If you already finished setup, you have to erase your iOS device and start over. If you don't want to erase, just transfer your content manually. Navigate to your Android device, open the Move to iOS app and tap "Continue". Read the terms and conditions that appear. Tap "Agree" to continue, then tap "Next" in the top-right corner of the Find Your Code screen. On your iOS device, tap "Continue" on the screen called Move from Android. Then wait for a ten-digit or six-digit code to appear. Enter the code on your Android device. Contacts, Message history, Camera photos and Videos, Web bookmarks, Mail accounts, and Calendars. 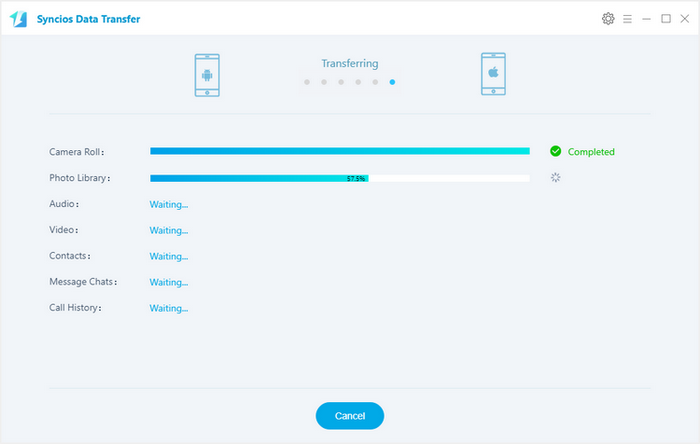 Syncios Mobile Transfer is a quite high user evaluation data transfer software, which supports not only transfer data like contacts, text messages, media files, call history, bookmarks, photos and more from one devices to iPhone 7, iPhone 7 Plus, but also can extract data from iTunes/iCloud backup files, and transfer to any supported iDevice or Android handset. TIPS: if you have any detection issues, please follow our iOS tutorial or Android tutorial according to your device. Tips: It allows you to extract what you want from iTunes and iCloud backup without performing full restoration on your new iPhone 7 (Plus). 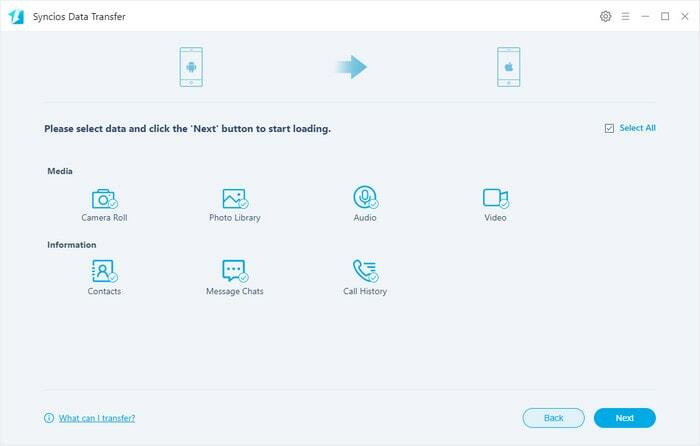 Free download Syncios, install and run it on your computer > Connect both of your old Android and new iPhones to computer with USB cables. Plug in both your old Android device and iPhone 7 or 7 plus to computer. Once they are recognized, you can see them on the program's window. On the middle checkbox, Select the categories you want to transfer to new iPhone 7 (Plus), such as Contacts, Messages, Video, DCIM Photos, Audio,	Call logs, Bookmarks. Tips: Please make sure that your old iPhone as the source phone is on the left, and the iPhone 7 as the target phone is on the right. If not, you can click the "Flip" button to exchange theirs position. Just start the data transfer by clicking Start Transfer. Data in your old iPhone will be transferred to new iPhone automatically, you can check the transfer process in the interface. Depends on the file types you selected, the transfer process may take you several minutes. When it's finished, the data on your old iPhone will be transferred to your new iPhone 7 plus. Android Samsung, HTC, LG, Sony, Google, HUAWEI, Motorola, OPPO, ZTE, Xiaomi, OnePlus and more Android models. Comparison between iTunes, iCloud and Syncios Data Transfer, choose the best one for you ! 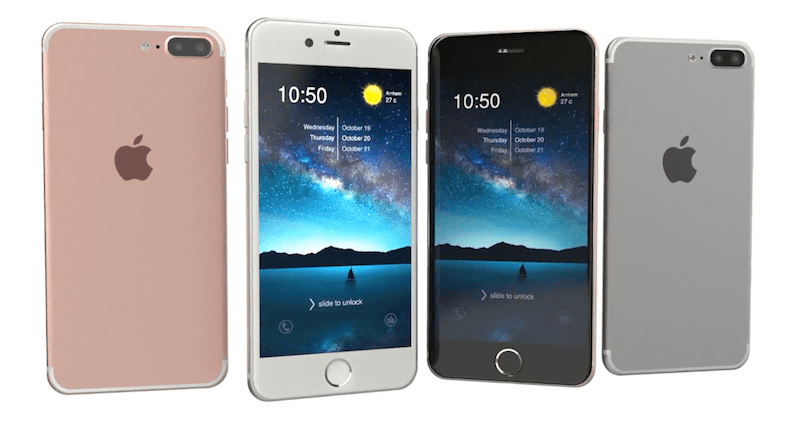 How to transfer data from old iPhone to iPhone 7/7 Plus? How to delete iPhone contacts?